I didn't really understand what "hyperpigmentation" meant and what it had to do with aging until I turned 35. Then I started noticing that instead of the cute freckles around my nose that only lasted the summer, I was getting brown spots on my forehead and cheeks that never went away. That scars left by breakouts would not fade as fast as they used to. In other words, that my skin tone was getting more and more uneven, slowly but surely. This is when I started turning to antiaging skincare products with a proven track record against hyperpigmentation. One of the most powerful ingredients for that is vitamin C: not only is it effectively fading sun spots, it also helps protect your skin against further sun damage when used under your sunscreen. 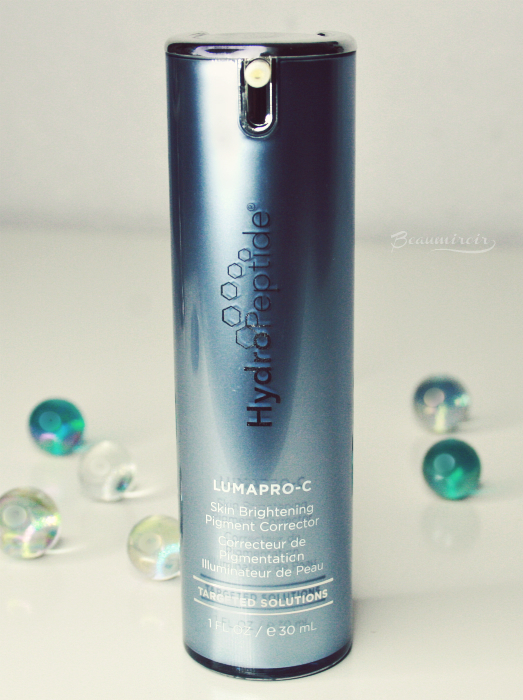 I have been using vitamin C serums every morning for more than a year, and I have recently had a chance to try a high-end option, Lumapro-C from Hydropeptide. Lumapro-C is described as a "skin brightening pigment corrector" and meant to be used as a serum, before moisturizer and sunscreen. Its main active ingredients include a stable form of vitamin C, the antioxidant resveratrol, and a peptide complex called DermalRX SRC (the ingredients list on the box I received is completely different from the list on the brand's website, and I don't know which one is correct, so I won't be able to go into details regarding the formula). The bottle looks and feels very luxurious, and its airtight pump delivers just the right amount of serum while protecting all the antioxidant goodness inside from air and light. I only need one pump for my entire face, so although this is a pricey serum at $148, I expect it to last several months (plus there's a 20% off code at the bottom of this post!). Here's where details are important and such a price tag appears more justified: most vitamin C serums contain the more basic form of vitamin C called ascorbic acid. This form is very unstable and will lose its potency very quickly after you open a container. Ever noticed a liquid vitamin C serum coming in a dropper bottle turning from clear to dark yellow or brownish within a month or so? This is due to the oxydation of the vitamin C, and you might as well throw away your product when it starts changing color because it becomes useless. Lumapro-C, on the other hand, combines a stable form of vitamin C with an airtight packaging, meaning that your serum will remain fresh and effective for the several months it will last. So yes, you pay $148 for it, but you won't have to throw it away when there's still half left in the bottle, which is very common with cheaper vitamin C products. The serum itself has a light and pleasant citrusy scent, it feels lightweight and it absorbs into the skin quickly. It provides quite a bit of moisture besides its brightening power: I have skipped my moisturizer and followed directly with my sunscreen a few times when the weather was warm, and my skin felt hydrated all day. I felt a slight tingling sensation a few times when my skin was already irritated before application (after workouts in particular, when my face gets red because of the wind and sweat), so I would not recommend it for very sensitive skins. It's always hard to judge the effect of a brightening product. I have been using this serum for over a month now, and my sun spots have not disappeared, but I feel like they're a little bit less dark, my acne scars lighten a little faster, and I'm not seeing new dark spots showing up on my face! 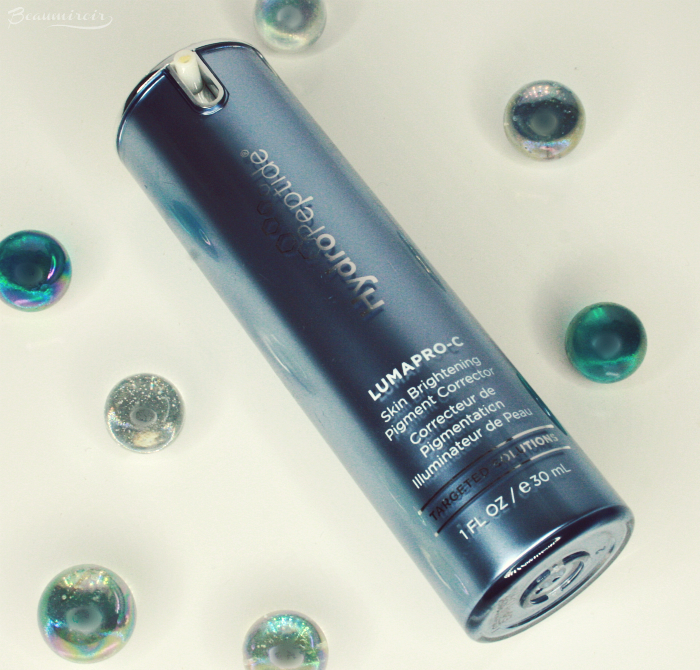 Hydropeptide's Lumapro-C is a high-quality brightening serum with a stable form of vitamin C and the perfect packaging to keep this product effective long after opening. If you are looking for a powerful addition to your antiaging skincare routine, it would be a solid choice! On the brand's website, use discount code BBLUMA20 to recieve 20% off your LumaPro-C purchase (that's almost $30 off! ).